Add description about uploading image. 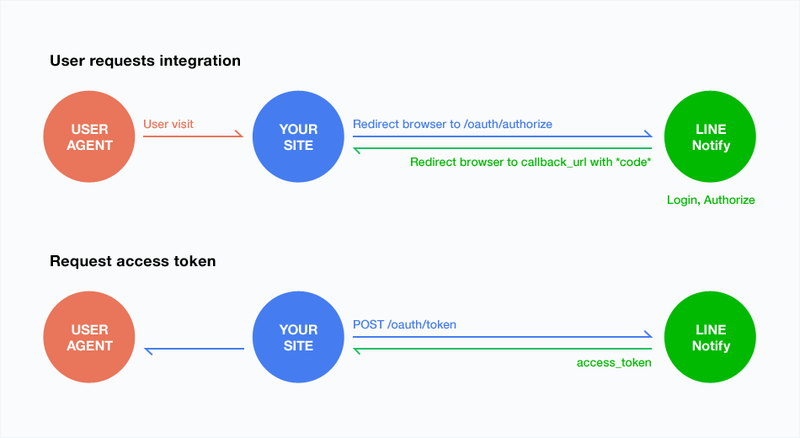 The API consists of an OAuth2 authentication part and a LINE notification part. The overall flow of the API is as follows. LINE: Select notification channel and check user agreement status. Redirect to connected service. As notifications can be configured and revoked on the web page, implementation of the API is optional. Overview: Becomes a provider based on OAuth2 (https://tools.ietf.org/html/rfc6749). The authentication method is authorization_code. The access token acquired here can only be used for notification services. The host name for authentication API endpoint is notify-bot.line.me. The following is the OAuth2 authorization endpoint URI. The received parameters are as follows. response_type Required fixed value Assigns "code"
Assigns the generated redirect URI. We recommend using HTTPS on redirect URI to prevent code parameter leaks. scope Required fixed value Assigns "notify"
CSRF attacks are typically countered by assigning a hash value generated from a user's session ID, and then verifying the state parameter variable when it attempts to access redirect_uri. LINE Notify is designed with web applications in mind, and requires state parameter variables. When successful, redirects to the assigned redirect_uri or posts according to the form with the parameters below attached. When there is a failure, redirects to the assigned reirect_uri with the parameters below attached. error_description string An optional huma-readable text providing additional information, used to assist the client developer in understanding the error that occurred. grant_type Required fixed value Assigns "authorization_code"
The response body is a JSON object type. access_token string An access token for authentication. Used for calling the notification API to be mentioned below. Overview: An API for LINE notifications. OAuth authentication is required in advance. It can be used to check connection status, actual notifications, and disconnecting. The host name for notification API end point is notify-api.line.me. Sends notifications to users or groups that are related to an access token. If this API receives a status code 401 when called, the access token will be deactivated on LINE Notify (disabled by the user in most cases). Connected services will also delete the connection information. Requests use POST method with application/x-www-form-urlencoded (Identical to the default HTML form transfer type). Upload a image file to the LINE server. Supported image format is png and jpeg. If you specified imageThumbnail ,imageFullsize and imageFile, imageFile takes precedence. There is a limit that you can upload to within one hour. For more information, please see the section of the API Rate Limit. stickerPackageId Optional Number Package ID. stickerId Optional Number Sticker ID. An API for checking connection status. You can use this API to check the validity of an access token. Acquires the names of related users or groups if acquiring them is possible. On the connected service side, it's used to see which groups are configured with a notification and which user the notifications will be sent to. There is no need to check the status with this API before calling /api/notify or /api/revoke. As LINE Notify also provides the same feature, support for this API is optional. If the notification target is a user: "USER"
If the notification target is a group: "GROUP"
If the notification target is a user, displays user name. If acquisition fails, displays "null." If the notification target is a group, displays group name. If the target user has already left the group, displays "null." An API used on the connected service side to revoke notification configurations. Using this API will revoke all used access tokens, disabling the access tokens from accessing the API. There is a limit to the number of times an API can be called on each service. The default number is set to 1000. The limit is per access token. The API Rate Limit status, can be checked on the response header of the API.